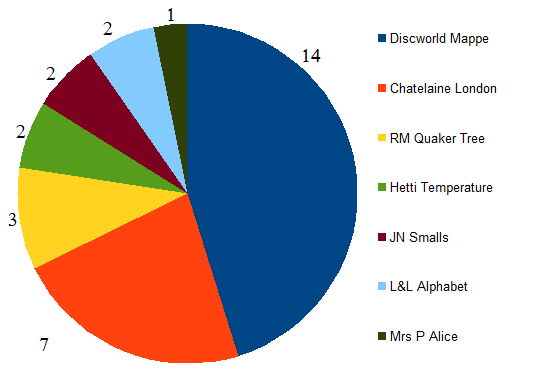 I am very pleased with my pie this month, it looks exactly as I planned - 2 weeks for Discworld, 1 week for my Chatelaine and the rest of the time on smaller projects including the Christmas and Hallowe'en SALs. 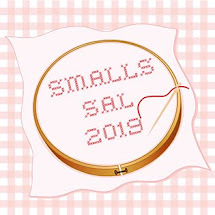 I could have finished the banner but it turns out that I ordered a skein of the darker pink not the lighter pink when I was stocking up on threads for this design. So I moved on to the island instead. The island is called XXXX (or Fourecks) and is the Discworld equivalent of Australia. "when Death requested a book about the dangerous creatures of XXXX from his library, he was subsequently hit by a large pile of books consisting of the various volumes of "Dangerous Mammals, Reptiles, Amphibians, Birds, Fish, Jellyfish, Insects, Spiders, Crustaceans, Grasses, Trees, Mosses and Lichens of Terror Incognita", the total books going up to Volume 29C Part 3, while a request for information about the harmless creatures merely produced a note saying "Some of the sheep"." Here is the total of the design stitched so far. I started in the centre and worked upwards to ensure the dyed circle was in exactly the right place for the circumference of the Disc. The darker blue represent the Deep Space the enormous world turtle Great A'Tuin is swimming through. Next month I will stitch another Heraldic Hippo and complete the banner. I am doing Stitch from Stash once again. This will be my 5th year so far. I did the original blog versions in 2014 and 2015, skipped 2016 as it was my Big Birthday year then signed up for Stephanie's Facebook version in 2017, 2018 and now 2019. I needed the Queen of Hearts as I will be starting her as soon as I finish Alice & the Flamingo. Mrs Peggotty happened to be having a 20% off sale this week so I grabbed a bargain! 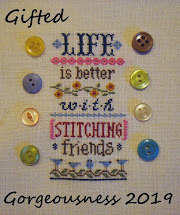 Finally, don't forget the Secret Stitching Sweetheart Blog Hop coming up on Valentine's Day. I think I've posted about it enough now for everyone to be aware it is coming soon but just in case you haven't signed up yet - read a previous post and find out how to take part. Haha! With the speed that January's gone it feels more like 3 than 93 days! Fantastic progress on the Discworld Mappe. Your photo really shows off how the design fits onto the fabric. It must have been quite nerve-wracking ensuring the measurements for dyeing were perfect. 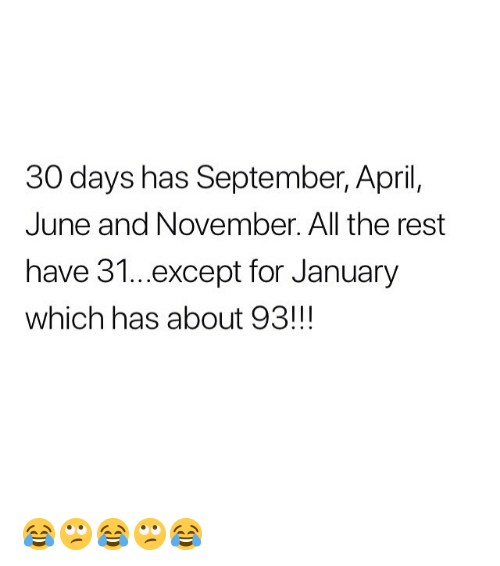 I'm always happy when January ends, too, Jo! This year, it didn't seem quite so bad as we had lots more sunshine than usual in spite of the frigid temperatures. Great progress on Discworld! And very restrained spending I'd say :) Happy February! Discworld Mappe is gorgeous and you made great progress on it! Jo: You have added some stitch's, I have done what you did ordered the wrong color, then have to wait for the right color to arrive. Wowsers!! That looks awesome on the custom dyed. That is really starting to take shape. Great start to 2019 Jo. And as always restrained on your SFS, I don't know how you do it. The Mappe looks great Jo and fits perfect on the fabric. Gorgeous work. Boy that mappe is just breathtaking. Love how well it fits on the fabric. Great job with your spending. I actually haven't bought anything stitching related. But boy I've seen a lot I wanted to haha. 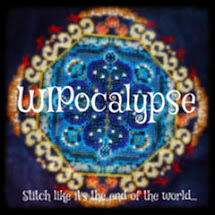 Thanks for sharing your Discworld Mappe and tyhe quote. My college boys love those books,but I just don't get them....Great stitching. 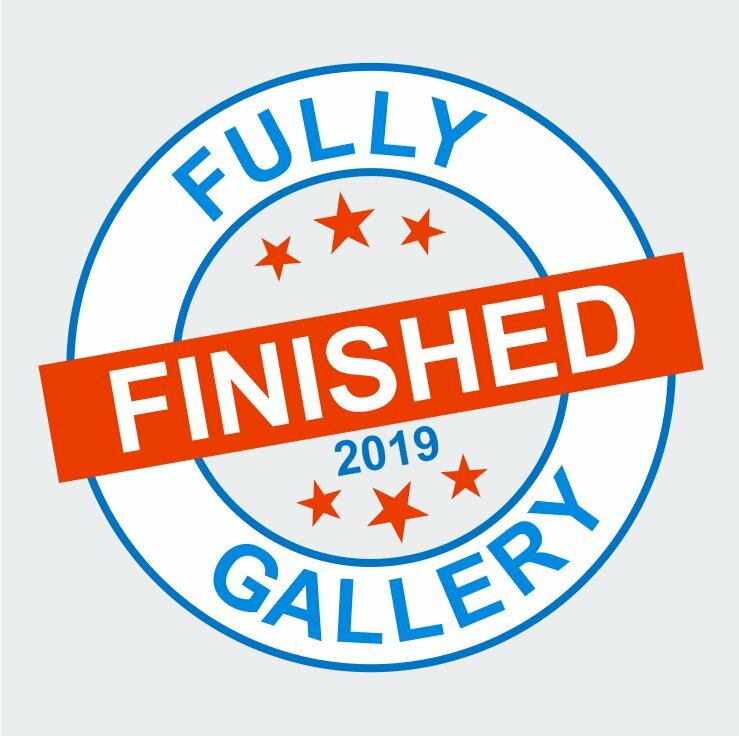 Hope you received my photos! I hadn't realised that disc was there. Good progress on the map. Wonderful progress on the map, two weeks worth of stitching really does move it along quickly. The map looks awesome! I can't get over how accurately the circle on the fabric fits the stitching. Beautiful progress, Jo! Discworld looks amazing, with how perfectly you spaced it on the custom dye. Pie is great, as always, love that visual representation. I also purchased a Cross Stitcher sub, a few months ago. I like the hot chocolate chart in the March issue. Happy stitching! Such great progress, what a beautiful piece of "blueberry" pie! Wow I love how you break this down. Your map is very nice looking.